BACKGROUND: Belief is that chronic disease prevalence is rising in Bangladesh since death from them has increased. We reviewed published cardiovascular (CVD) and Type 2 Diabetes Mellitus (T2DM) studies between 1995 and 2010 and conducted a meta-analysis of disease prevalence. METHODS: A systematic search of CVD and T2DM studies yielded 29 eligible studies (outcome: CVD only = 12, T2DM only = 9, both = 8). Hypertension (HTN) was the primary outcome of CVD studies. HTN and T2DM were defined with objective measures and standard cut-off values. We assessed the study quality based on sampling frame, sample size, and disease evaluation. Random effects models calculated pooled disease prevalence (95% confidence interval) in studies with general population samples (n = 22). RESULTS: The pooled HTN and T2DM prevalence were 13.7% (12.1%-15.3%) and 6.7% (4.9%-8.6%), respectively. Both diseases exhibited a secular trend by 5-year intervals between 1995 and 2010 (HTN = 11.0%, 12.8%, 15.3%, T2DM = 3.8%, 5.3%, 9.0%). HTN was higher in females (M vs. F: 12.8% vs.16.1%) but T2DM was higher in males (M vs. F: 7.0% vs. 6.2%) (non-significant). Both HTN and T2DM were higher in urban areas (urban vs. rural: 22.2% vs. 14.3% and 10.2% vs. 5.1% respectively) (non-significant). HTN was higher among elderly and among working professionals. Both HTN and T2DM were higher in 'high- quality' studies. 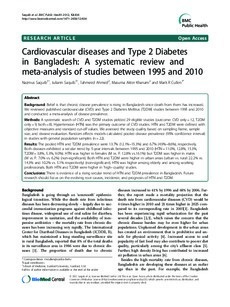 CONCLUSIONS: There is evidence of a rising secular trend of HTN and T2DM prevalence in Bangladesh. Future research should focus on the evolving root causes, incidence, and prognosis of HTN and T2DM.